Well, you know which one I’m going for…. I’m choosing the one in the light. The flower (lily?) looks like festoons of finest muslin. Think it might be a frilly tulip – still waiting for my friend to get back to me! Muslin is an apt comparator…. When I click on the artist page of the gallery website – http://supervisionnewyork.com/gallery/ there is a rapid showing of images of various artists. One of the images…near the end of the series…resembles your white background work. I can’t seem to identify which one it is out of their listing. Interesting. This time the white one! The sepia aging was none of my doing! Oh, and have a lovely day! 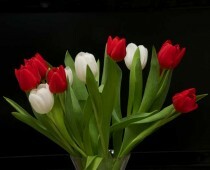 A dark background is highly effective with light objects as with your decaying flowers. But a white background emphasizes the soft and delicate in the flowers. Ergo, both can be used. White. And I would crop that flower head into a square. Now it looks like a tulip! Bottom one for me too. Though I agree the black background can be very effective. The black makes for a more dramatic image, but the backlit light image contains more intricate detail…. I tend to like black, but I much prefer the white here. Go with what you like, Jo! The white one, for the shapes as much as the detail. First one looks lumpy by comparison. Angle? But more likely light. I love the white/light background. It’s different; it looks like a drawing. Yes, because the flower is backlit, and the petal detail comes out…. I do like the dramatic black background Sue but the white seems to be more in keeping with the delicate aging, gives it a an air of fragility.